Why do cats sleep so much? And are they truly sleeping, or just resting? Do they dream? Is cat snoring normal? Read on for facts about sleeping cats. Cat Behavior What Does Catnip Do to Cats? Why do cats sleep so much? Our feline friends are true masters at falling asleep any time, any place, under any circumstances. Even a cursory web search will reveal thousands of photos of sleeping cats in cute or crazy positions. But why do cats sleep so much, and what happens in their minds when they’re sleeping? Do they have sleep cycles like people do? Read on to find out more about sleeping cats. An orange tabby cat sleeping with his eyes closed. Photography ©Ryhor Bruyeu | iStock / Getty Images Plus. When answering the question, “Why do cats sleep so much?” let’s first look at how long cats sleep. Cats can sleep as much as 16 hours a day, and older cats spend even more time at rest — as much as 20 hours a day. That sleeping habit is a result of the cat’s evolution, nutritional habits and physiology. In the wild, cats have to hunt in order to eat, and the stalking, chasing and killing of prey burns a lot of energy. Sleeping helps cats conserve energy between meals. Another thing to consider when thinking, “Why do cats sleep so much?” is how they sleep. Of the time cats spend sleeping, about three quarters of it is what we might call snoozing. In that state, cats can get all the rest they need, but they’re still alert enough to awaken at a moment’s notice. You can tell when a cat is in light sleep because their ears will twitch and rotate toward noises and their eyes will be open a tiny bit. Even when they’re sitting upright, cats can slip into that dozing mode. The remaining quarter of cats’ sleeping hours is spent in deep sleep, but older cats might spend as much as 30 percent or 40 percent of the time at that level. Cats in deep sleep are usually curled up with their eyes tightly closed. Sometimes, they might even have their tail over their face, like a fluffy sleep mask. Deep sleep is critical for the body’s ability to regenerate itself and stay healthy. It’s also the time when your cat dreams. If you’ve seen your cat’s whiskers or paws twitching while she’s asleep, there’s a good chance she’s dreaming. Cat snoring happens when the airway is obstructed by extra skin from the soft palate. This is most likely to happen when your cat is relaxed, so it wouldn’t be outrageous to notice your cat sawing some tiny little logs from time to time. Snoring is more likely to occur in short-nosed or brachycephalic cat breeds such as the Persian, Himalayan or Exotic Shorthair. When asking, “Why do cats sleep so much?” you might also wonder if there’s some such thing as too much — or too little — sleep. If your cat starts sleeping a lot more or a lot less than usual, contact your veterinarian. Excessive sleep could be a sign of illness or pain, while frequent wakefulness can indicate a problem such as hyperthyroidism. 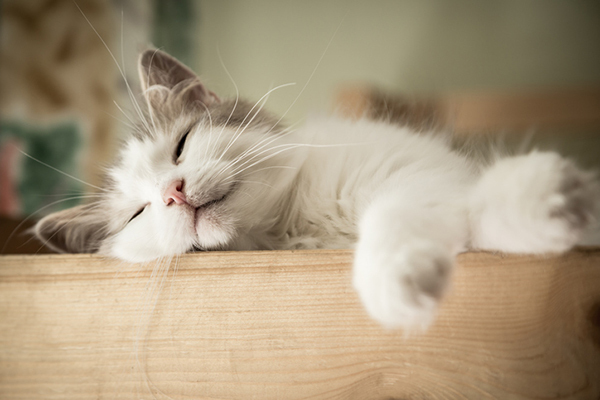 Tell us: Do your cats have any odd — or cute — sleeping behaviors? Please share them in the comments! Sleeping With Cats: Yay or Nay? 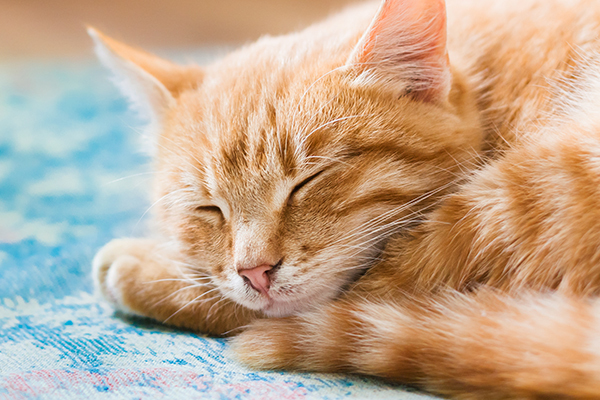 Is Your Cat Sleeping Too Much — or Not Enough? My cat, Cali loves to sleep. She is 3 years old and has slept a lot ever since I got her at 2 years of age. She is my constant lap cat and loves to sleep next to me during the night. I told my vet Cali sleeps a lot, he said as long as she has always been that way there is nothing to be concerned about. Persephone, how did the vet remove the fleas? Do you mean they put flea medicine on him, or do you mean something else? My two Himalayan cats don’t play together anymore and they spend most of the time sleeping is this normal behavior or should they be playing more! Pingback:How Many Hours A Day Do Cats Sleep? Why Do They Sleep So Much? I used to have a cat that slept so soundly at night that I would roll over on him and he wouldn’t move! If I tried to wake him up, he was so cold, I was afraid he died! Guess he was hibernating! In the winter, the two cats I have now will relax on my lap as I lean back in my recliner. then we all take a nap together! They both lay next to whatever part is hurting (like my right hip) and purr. And that really helps. I had heard that purring is therapeutic and it is absolutely true. They are incredible. Our kitten is like a baby, he sleeps and eats during the day and wakes up around 4 am and he doesn’t want to do any other thing than play! Our cats have always been sleepers, and since both my wife and I work, they have the whole house to themselves, which includes our bed. When they wake up, they are so full of energy, which makes them shoot from place to place just like they have rockets stuck to them. What a life. I wish I was a cat, but in a home where I’m loved, like ours have always been. My Honeycat always slept on my chest. All night long, she would be curled up with her head right over my heart. I’m sure she found the sound of my heartbeat comforting. Any time I stirred she would immediately start purring. I loved it; the only problem was having to spend the entire night every night in the same position to accommodate her. I wish one of my cats would sleep more! She is so high energy she is endangering my health, literally. If she would only take a nap when I’m working and stay off my desk, my computer, my printer, quit knocking everything off!!! She is driving me insane. I’ve tried to shut the door and she sounds positively pitiful howling outside it. Like I’m the meanest mommy in the world. Then my “good kitty” can see I’m upset with her, so he attacks her. I feel sorry for her, but my goddess she is driving me insane. I was screaming at her after an all-day drive-me-crazy-marathon when I had to meet work deadlines–and I had a stroke, literally. Flyers out but no one has called. When I’m not at my desk, she is a sweetheart, that’s the only thing that redeems her. But after the stroke it’s just not enough. It is a flat out lie that pets always relieve stress. I wonder if your kitty has hyperthyroid? A simple blood test at the vet could reveal this. Also, I know my kitties try to get my attention if they aren’t getting enough of my time. If I stop and focus on playing with each for just a few minutes, they are then satisfied and take a nap or focus on a toy or each other. Best luck in your recovery and with your kitties! Try taking time in the morning to play with your cat. I mean really play. Birdie wand, throw the toy, everything! Tire her out! See if she will walk on a lease and take her for a walk. Put bird feeders in your windows for kitty TV. Give her something to do besides hang with you. Hope tis helps. Edwina, She is probably reminding you, or trying to tell you. You work too much! Cat’s I just Love them. My lady cat has nightmares of when she was attacked and severely injured by a dog. She’ll sometimes cry in her sleep, but sometimes she lets out these loud blood-curdling screams and wake herself up. There have been times when I’ve had to move my cats while they were in deep sleep and thought they were dead because they were totally limp and didn’t wake up right away! My Shady likes to sleep on a heating pad. she is so spoiled, when one of her sisters try to get on the heating pad with her she runs them off! Otherwise is very sweet and loves her sisters…….just don’t come between her and her heating pad! I thought of that for my Roscoe. I wondered if you wrap it in a towel and keep it on low setting or is ther anything else you do? I used a heating pad for my almost 19 yr old cat, Tiger. He was very old and thin. I just laid it on the floor where he always liked to lay and kept it on low. He’d move on and off of it as he would get too warm or too cold. You can get heating mats especially for pets. My outside cats spend their nights in crates in the garage, and they each have their own heating mat to sleep on. When we had a dog, she also had her own heating mat. My cat does the same, except she does it when I am sitting in my recliner reading in my livingroom-and I swear that even if she is in the bedroom and I open a book(or my laptop) and she is in the other rooms she is right there in the livingroom sitting on my chest so I can’t read(or use my laptop)- I guess the old saing “dogs have owners, cats have staff” is true! My cat likes to sleep on my head or my chest. I found him in Spain and bought him back to the UK when he was a kitten. He spent his first few months living on my chest because he was very nervous and now he cries if he can’t lie on me. The sound of his purring helps me to sleep, i love the sound of it. I can’t imagine sleeping without him. My cat is 12 years old now and we are still inseparable. My boy “Milo” sleeps on his back with his feet in the air and his tail is flat out. It is the cutest sight in the world. My one cat sleeps a lot. She also has nightmares which make her wake up with a start and sometimes with a hiss too. She is turning 5 this year, so it isn’t age. The vet says she has no underlying problem so we are thinking something in her first 3 years of life was traumatic. We adopted her 2 years ago at the local shelter. She had been there 8 months, having been brought in during birthing a kitten. She also has problems riding in the car and pees in the carrier. And we think that’s because she was brought in to the shelter during labor. No wonder she has nightmares. She probably did have something terrible happen to her. My cat screams too in her sleep. I think she has nightmares about the time she was attacked by a dog. My cat Frostbite found us at Christmas time in 2014. He was five months old but small and covered with fleas. We took him to the vet to get him fixed and the fleas removed. I had tried to find him a home but he got so attached to me n one day that we had to keep him. He had terrible night terrors and will shake and sometimes pee in his sleep if I don’t wake him in time. Other than that he is a perfectly happy and healthy and my very fat, happy baby boy!